I love that History of Love quote. I don't remember being super into the book when I read it however many years ago, but that line makes me want to reread. I guess that's what a well-chosen quote does, though. These are all great, particularly The History of Love and East of Eden quotes. Really great. The Painted Veil is one of my favorite books. Love this quote! I did quotes as well. You have a bunch on here I've never seen before - I especially like #5 and #8. My list of quotes is here. Oh, the History of Love quote is just lovely. And I don't know the first thing about The Painted Veil, but I love that quote as well! The History of Love quote is beyond sweet! I love it! Makes me want to re-read the book. That Philip Roth quote is freakin' awesome - and so emblematic of his entire oeuvre! He may be a dirty old man, but he is a wise one. And, despite my tough guy facade (ha! ), I love that History of Love quote, too. On pg. 62, she also says "Her kiss was a question he wanted to spend his whole life answering." She's good. Love these quotes. Our centerpieces at my wedding were old stacks of books with framed quotes from my favorite authors on top and I used that History of Love quote. Here they are if you want to see them! Another quote collector, awesome! I've never read any of these books, but they all sound fabulous. Makes me want to read them all! 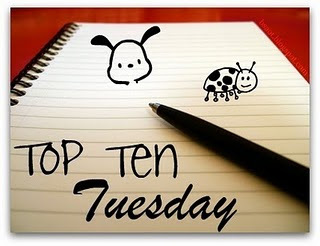 Here's my post for Top Ten Tuesday, a list of the books that most intimidate me. And I'll be part of the Easter Eggstravaganza Blog Hop Giveaway that begins tomorrow. I hope you will stop by my blog and enter my giveaways to try to win some great prizes. I love literary quotes, but rarely take the time to write them down as I read. These were wonderful quotes culled from great books. So good. The History of Love quote reinforces the fact that I need to read it. Dewey's 24-Hour Read-A-Thon: Let's Go!